It’s finally here! This book, 20 years in the making, is full of photos, ideas, tips, Scripture, humor, and practical application. In it, you will find help for your home and school and hope for your soul. You might think I’m not just a homeschool mom like you. I’m the epitomy of the Homeschool Supermom - or so it may seem. I’ve homeschooled my nine amazing kids for 20 years. But it’s time for me to climb down from the pedestal, and in total transparency, explode the Supermom myth. It’s finally here! This book, 20 years in the making, is full of photos, ideas, tips, Scripture, humor, and practical application. In it, you will find help for your home and school and hope for your soul. You might think I’m not just a homeschool mom like you. I’m the epitomy of the Homeschool Supermom - or so it may seem. I’ve homeschooled my nine amazing kids for 20 years. But it’s time for me to climb down from the pedestal, and in total transparency, explode the Supermom myth. I invite you to be the proverbial fly-on-the-wall in our homeschool. You will be strengthened and encouraged as you see that I - the Homeschool Supermom - really am just like you! See photos of our house (unwashed dishes, dirty laundry, and all). Read stories of how we’ve worked out our problems (we all have them). Do Bible studies that will strengthen your soul. Equip yourself with lots of great ideas. Learn about resources that are available to you. Shore up your convictions. Cry over your sin. Laugh at the comics (by Todd Wilson, FamilyMan) and jokes. Most importantly, find strength in the grace that is readily available to you. But, “homeschooling” is just the outer trappings. If you’ve been homeschooling any length of time, you already know that it’s not your great curriculum, your clever chore chart, or your organized life that make or break your homeschool. It’s your heart. Homeschooling is merely a tool that God is using to make and shape you. So, after all the tips and ideas that permeate the pages of Homeschool Supermom...NOT!, my prayer is that the Holy Spirit will gently and persistantly draw you back to the matters of the heart. This book will help you to make those connections and lead you to make changes that will impact your school, your family, and your life. *"Enjoying Homeschool" is Not an Oxymoron (on dealing with discouragement). In the appendices there is information on building a conviction to homeschool, homeschooling boys, curriculum ideas and lists of books, helpful resources for organization, marriage, and parenting, and even a note to single moms. My hope and prayer is that as you read this book, you will be touched, encouraged, equipped, entertained, convicted, changed, and strengthened. I wish I had this years ago!! It is so much more than just a homeschooling mom's book - it's a wife & mother book aside! It is so convicting - yet encouraging. Wow! Thank you for this book. I am starting a Bible study with some homeschool friends and going to bring this and the Come to the Garden as an idea to recommend for us to go through! I am reading this book for the second time! It is so real, so convicting and so encouraging. I can relate to Susan in so many ways. I, too, have several boys, some of whom are distractable as well! But, even more importantly, is how I can relate to her as a Christian, daily in need of God's grace. 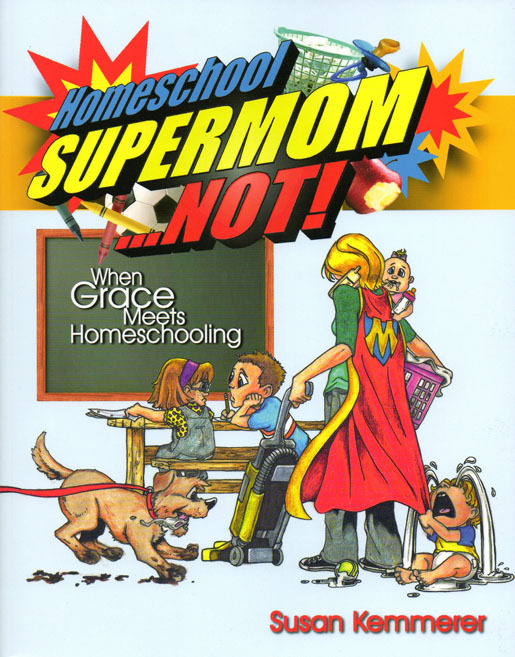 This book won't give you a one size fits all solution to your homeschooling struggles, but will point to God's grace, in a loving and humorous way. As I was reading this book this week, I was convicted of some many things! Though it's a hard place to be, it's also a good place as I can repent, ask forgiveness and grow in my walk. I would recommend this book to anyone who struggles with heart issues (both their's and their children's) and who desires to really live out their faith in front of their family. Susan also suggests some helpful resources, that I've read before reading her book. Her overall homeschool/parenting philosophy seems a bit like mine. I guess that's why I find her book so refreshing and encouraging! Would you love to relax and sit in the living room with a welcoming, wise, and wonderful veteran homeschool mom? If yes, you need this book! Susan Kemmerer is the homeschool friend every mom longs to have. In person she is sweet, encouraging, engaging, caring, sympathetic, and REAL. In this book she is sweet, encouraging, engaging, caring, sympathetic and REAL! I absolutely treasure this book, as it speaks to the heart, mind, and soul of a Christian homeschool mom. Susan will be the first to admit that she doesn't have it all together (as evidenced by the title), but she has decades (literally!) of wisdom, advice, and pointers to pass along to her readers. You won't want to miss the practical and spiritual guidance she shares in this easy-to-read, hard-to-put-down book! P.S. One thing I especially appreciate about Susan---in this book and in real life---is her love for the Lord and her love for her husband. She has a candid way of expressing both and encouraging others to do likewise.